• Heavy duty usage guillotine designed to the highest standards. • Carry handles designed for safe transportation. • Paper and photograph size templates etched onto the steel baseboard for instant cutting guides. • Magnetic backstop is lockable and adjustable to enable accurate repeat cutting. • TÜV certified for safety and quality; an automatic locking system secures the blade when not in use. • Comes with an in-built extra safety locking mechanism. • Transparent safety guard folds for easy and convenient storage. • Self sharpening blade provides smooth, accurate cutting action.. This Avery Precision Guillotine features a self-sharpening steel blade, with a unique blade cover for safety. The guillotine also features printed guides for accurate cutting, a magnetic backstop and a clippings tray to collect offcuts. 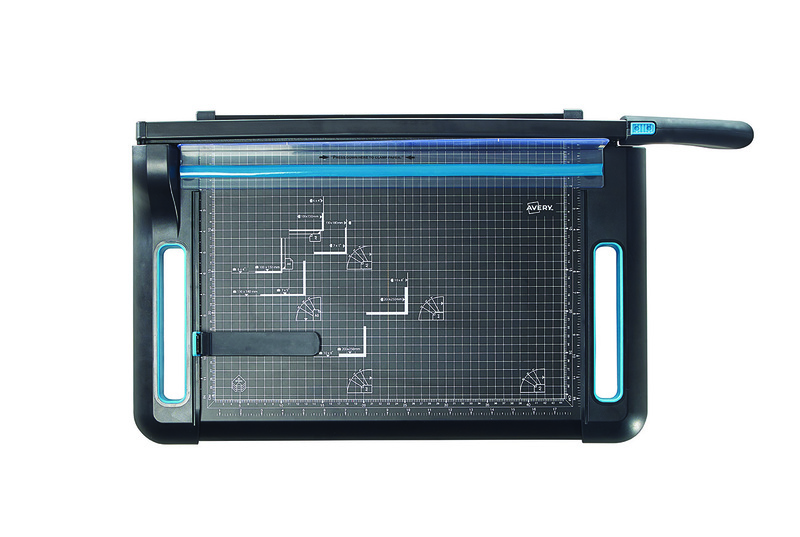 This A3 guillotine has a cutting length of 460mm and a capacity of up to 30 sheets of 80gsm paper.